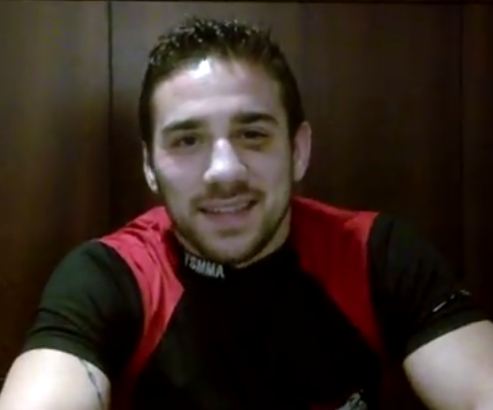 The MMA Journalist: Jimmie Rivera on Aljamain Sterling: "I Don't Even Think He's That Good"
Jimmie Rivera on Aljamain Sterling: "I Don't Even Think He's That Good"
To hear Jimmie Rivera tell it, Aljamain Sterling isn't all that. At a visit to the Tiger Schulmann MMA school in Manhattan last week, The MMA Journalist sat down with the Bellator and WSOF veteran and talked with Rivera about his past, present and future. Rivera - who had just taught a kids' class and was about to teach a class full of adults - spoke of his TUF 14 loss to eventual runner-up Dennis Bermudez, as well as his goals in the sport. But one fighter on the UFC's roster drew much of Rivera's ire, a local fighter who Rivera claims twice turned down fights with him before the UFC called him up. That fighter was Team Serra/Longo rep Sterling. Not long ago Rivera had pegged Sterling as someone who, if he beat him in the New Jersey regional circuit, would be his ticket back to the Octagon - a destination Rivera has been hoping to reach since before he won belts in King of the Cage and Ring of Combat. "He's in the UFC, I saw his fight, it wasn't even impressive at all. The other guy took it on short notice. He took it on a month's notice, the other guy took it on even shorter notice, and he almost lost. I wasn't really impressed with the fight itself at all. I don't even think he's that good, to be honest with you. Hopefully, I'll get to the UFC and get to the chance to fight him, 'cause once you get to the UFC you can't really back out from that. Unless he wants to fake injury or something like that... I'm itching for that fight, so I can't wait for that one to happen." If Rivera and Sterling were to ever meet in the UFC cage, it wouldn't be the first time that the organization has made a match-up that would have been inevitable in a particular regional circuit. At UFC 87, Jon Jones took on Andre Gusmao, and Costa Philippou has faced both Nick Catone and Tim Boetsch in the Octagon. All five fighters were products of the Northeast fight scene. Will Rivera and Sterling eventually face each other? Who can say. But they both reached the top of the local food chain, and it would be a great fight.